Imagine a future when promising drugs won’t take a decade to develop, when early success more often translates to later adoption, and when we no longer need to rely on animal testing. After decades of snail-paced progress becoming the status quo, this would be nothing short of a revolution to the pharmaceutical industry. At some level, the key to this future increasingly aims to emulate the physiology of the human body with microfluidic chips to better screen the drugs most likely to work for us. 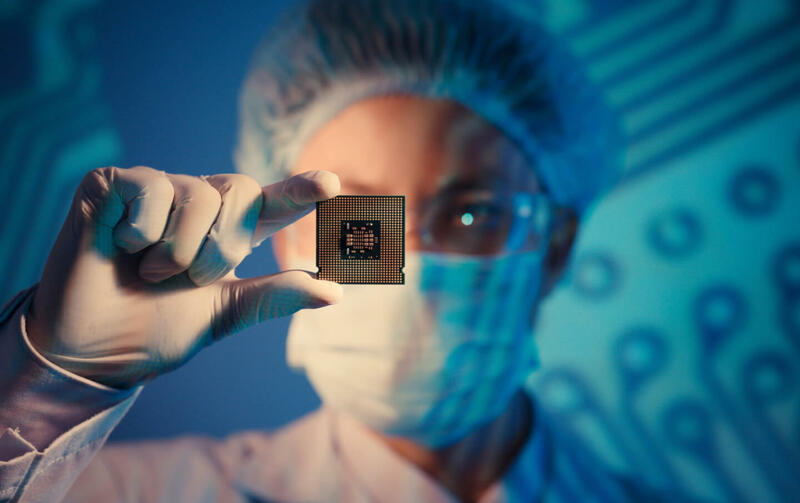 Fraunhofer, a German research organization, for example, recently announced they have developed what they call a “synthetic organism on a miniature chip” to stand in for the human body in the testing of new drugs. 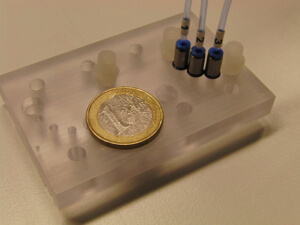 Fraunhofer’s synthetic organism on a chip. Researchers implant human cells from different organs into wells in the chip and connect them to each other by tiny canals. A micro-pump stands in for the heart, circulating cell culture between the “organs” to more closely synthesize these systems in vivo. Currently, animal testing is the first stage of drug research. However, different species interact with test drugs differently, and of course, animals are not humans. Without a highly accurate way to determine whether a drug is beneficial or detrimental to humans, researchers are reliant on human trials. Ultimately for the thousands of chemicals tested over years in the lab, very few make it to market. And of those, a few more may be recalled after trials due to previously undetected side effects. In the past, one proposed solution is to test drug candidates on human cells (e.g., from the liver or heart) in a petri dish. However, this method doesn’t accurately portray the systemic nature of our innards. Cells live within three-dimensional organs, which are in turn part of a complex systems interacting with and dependent upon other organs throughout the body. The hope is that Fraunhofer’s new system can better simulate that bodily ecosystem and increase the accuracy and speed with which we can screen new drugs. “We use cell samples from various sexes and ethnicities. We can set variations in body size and weight as desired on a scale of 1:100,000,” says Dr. Frank Sonntag of the Fraunhofer Institute for Material and Beam Technology IWS. By studying the metabolic products of cells and how they effect other cells, Fraunhofer claims results may be more predictive than animal-based experiments. Of course, as you might expect, Fraunhofer is not alone in their quest to better simulate the human body for drug testing. Last year, Donald Ingber of Harvard’s Wyss Institute founded Emulate—a startup to mass produce a “human on a chip” on a transparent piece of microfluidic silicone rubber. Like Fraunhofer’s chip, Emulate’s device places human cells (lung, liver, intestine, skin, kidneys, and eyes) on the chip, connects them via micro-channels, and pumps fluid through the system. Others, including Oxford University’s Virtual Assay project, are working to more closely simulate the human body in silica—using raw computing power to bring the body to life by algorithm and test drugs on virtual heart cells (and maybe soon skin and brain cells). How close are these technologies to implementation? For now, they remain strictly experimental. In the coming years, they’ll have to show their mettle, prove they are an accurate predictor of what happens in the body. And the truth is, in the near future, they will remain approximations of a complex system. However, while such devices may not be a perfect simulation, they should speed up the discovery process and make it easier to find new medicines that are more likely to work in human trials—and hopefully, in humans more generally.